From the Apple Watch to Google Glass, FitBits to virtual reality headsets, wearable devices have made technology almost ubiquitous in our daily lives. Over the past few years, wearable technology has exploded in mainstream markets, and sales are only expected to climb as designers and engineers alike continue to try to up the ante and come up with the next big idea at the intersection of fashion and technology. Upping the ante is exactly what Tech students set out to do at this year’s Miss America pageant. 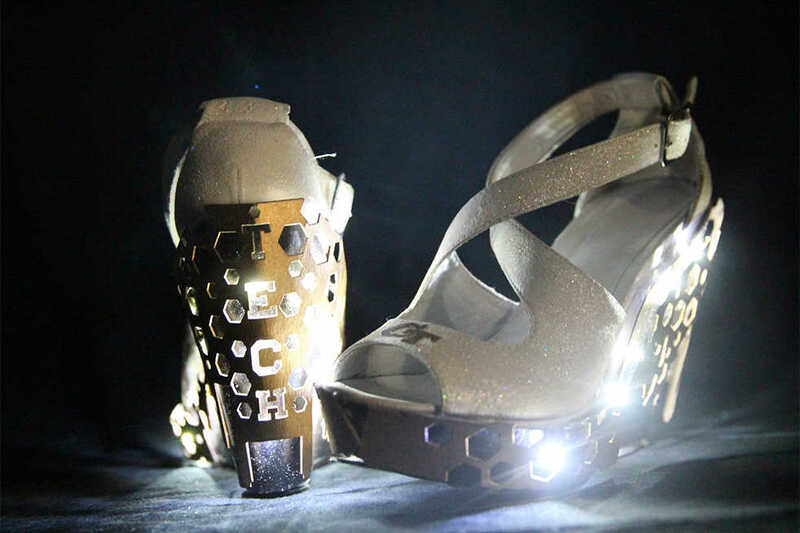 Two years ago, Maggie Bridges, former Miss Georgia and Tech alumna, donned the first-ever pair of 3-D printed shoes, designed by a team of Tech students, on the Miss America stage. This year, another Tech grad headed for Miss America, and she wanted her shoes to shine. Patricia Ford (BS Business Administration ‘15) was determined to show off her Yellow Jacket pride on the national stage, so she enlisted the help of Ryan Beckmann, EE, and Jordan Thomas, ID, to design truly show-stopping heels for the annual “Show Us Your Shoes” parade. Miss Georgia was pleasantly surprised at what the students were able to come up with. “I had no idea Ryan and Jordan were planning on having the shoes computer-programmed so they would light up in different patterns based on the movements of my foot. This was definitely my favorite feature,” Ford said. As the first Miss America contestant to wear computer-coded shoes, Ford was happy to send a message to young girls who may look up to her. “I loved thinking outside of the box and stepping away from the ‘traditional’ shoe that’s covered in rhinestones and feathers. I wanted to make a statement by showing girls that you can be unique and innovative in your ideas, and it’s cool to incorporate technology —even in something as seemingly simple as a Miss America parade shoe,” Ford said. A Georgia Tech education allows students to combine their love of STEM with their other diverse interests, which is why the school attracts such a vast population of unique individuals, not solely an army of engineers. Ford recognizes that even though she wasn’t a STEM major, her future is inarguably tied to the fields of science and technology. Ford walked away from the pageant as one of only two contestants awarded the “Women in Business Scholarship.” She will continue to serve the state of Georgia until next June when she crowns her successor. She plans on continuing to travel around the state, serving her community and raising money for the Children’s Miracle Network Hospitals. Although representing the state of Georgia in front of the whole world is no small feat, Ford never forgets where her journey started and the values that the school instilled in her. This is what she focuses on when performing for a crowd of millions. “Georgia Tech’s motto of ‘Progress and Service’ is something I remind myself of regularly, even after graduating from the Institute. Some people may see Miss America as a high-stakes national competition, but my core mission and vision was always to pursue excellence while loving and serving others,” Ford said. “I am reminded that we are all a work in progress, and if we shift our focus to serving others and the community around us for the better, then the rest comes easily and we’ll always walk away a ‘winner,’” she says.